Ooh this yellow and blue packaging is so exciting from Neal’s Yard Remedies, as usually their packaging is just blue and white! That is what first attracted me to this hand cream, I’m ashamed to say. Like a bee to a sunflower, I am drawn in by the enticing, vivid, yellow tone of the new swanky packaging. 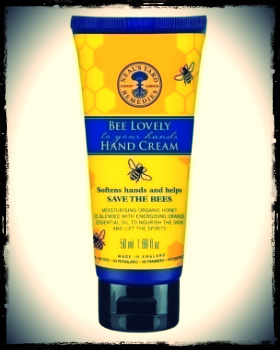 With great excitement I tried this new cream ‘Bee Lovely To Your Hands’ (£10), and I was far from let down. The zesty fragrance of the cream was the first thing that hit me as it came out from the tube with a small squeeze. As the cream sat on my hand and I knew it was going to be good. I knew this because it had a slightly firmer density than the usual supermarket hand creams. I like a cream with a high density, I find that it embalms the hands and protects them for a lot longer than other lighter creams, which go immediately, leaving only marginally softer skin for an hour or so. Which consequently, means that you have to reapply the hand cream and the tube is gone in half the time of a more expensive brand. But, the cream in question was right in the middle of the density scale, in between supermarket cheaper hand creams and then more expensive or chemist bought brands and it did a fairly good effort in all in. The staying power was great, even after two hours I was still feeling the benefit of application! What stands this cream apart from other hand creams is the fact that it’s a real treat to use. It’s a double sensory experience affecting both touch and smell. It is invigorating to use this hand cream, and literally brings nature into the palm of your hand. I was very impressed, especially with the recent dip in temperature recently, for a few moments while applying the hand cream, I felt like I was in an orangery in southern Italy with the sun beating down and the soft hum of bees drifting in the air. The ‘Bee Lovely Petition’, they started, gained 117,345 Bee Lovely signatures (one of which was mine!) . They were then taken to Downing Street, to get the government to stop using 3 deadly neonics. Keep watching this space, for more news on how the petition went. Or get up-to-the-minute bee news by following @SoilAssociation on Twitter, to see if our collective voices have been heard, and if these deadly pesticides have finally been banned. The ‘Save The Bees’ collection gives 25p of each Bee Lovely product to a Bee Lovely Charity, such as Friends of The Earth, Biobees, Landlife and Project Dirt. In my opinion Neal’s Yard Remedies is a reliable brand, they produce high quality products for reasonable prices. The ingredients are environmentally friendly and they have a firm no animal cruelty stance. They are a definite favourite of mine and this campaign confirms just why, ethically and morally, they are right up my street! 10 Lipsticks out of 10!